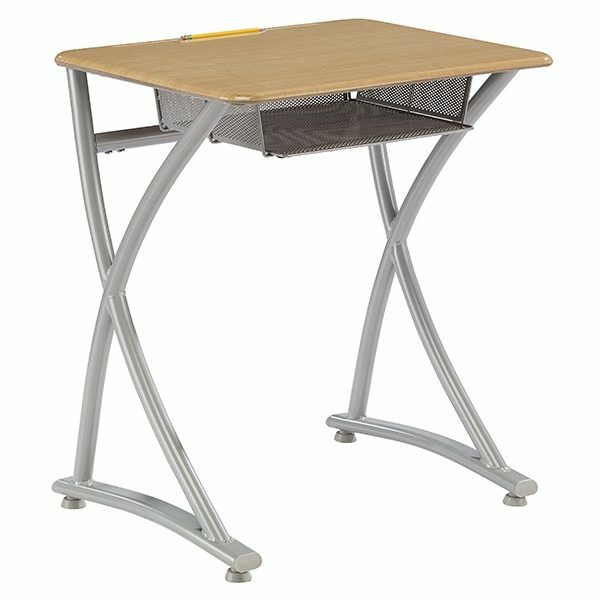 Futuristic, interlocking leg supports rise to a 500+ square inch desktop, with room for books and laptop. Height-adjustable, wide frame design offers extra leg room in any grade. 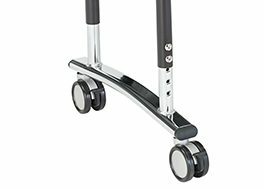 Optional casters, glides, bookbox, modesty panel and backpack hook. 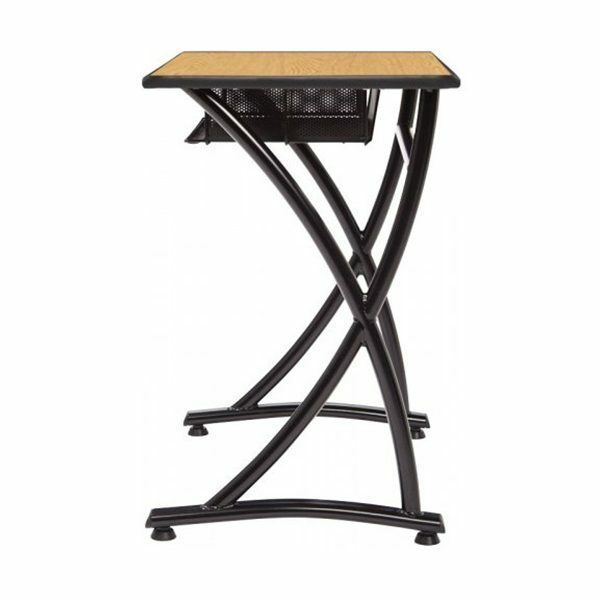 Held together by steel tubing and not by the book-box, this desk is more than just elegant and modern -it is strong. Students can sit comfortably with the optional Modesty Panel. 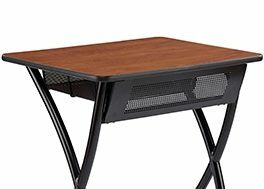 This desk comes standard with adjustable screw-in glides. Want to go mobile? 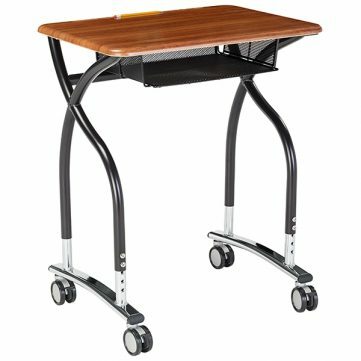 This desk is compatible with our 3" heavy duty casters. Safety first. Avoid students tripping over their backpacks by adding backpack hooks to the desk. Heavy backpacks? 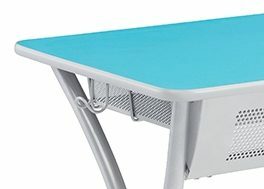 For added strength, the backpack hook is securely attached to the unitized frame and not the desktop. Select adjustable of fixed height versions according to the needs of your classroom. Modern and Sleek, don't compromise style over strength. Customize your V2 Desk, many options and variations to choose from. Explore the Collection. Traditionally Modern. Style and Strength are always included. 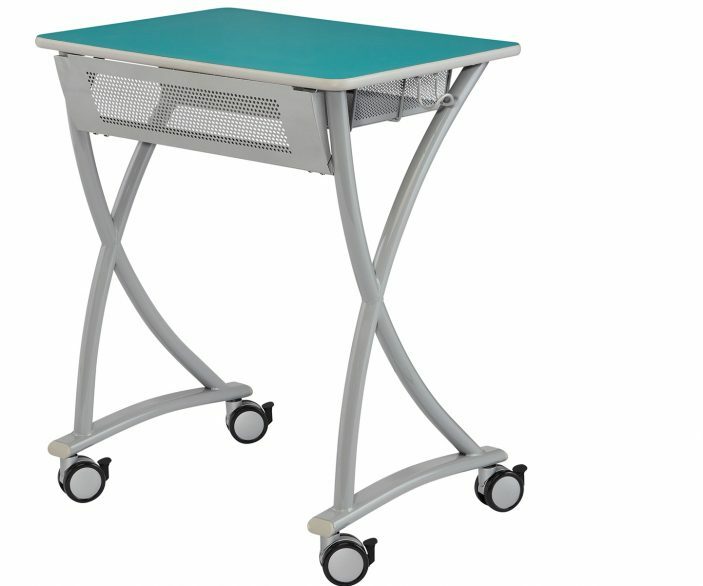 The wide frame design gives students extra leg room and the legs are height-adjustable for use in any grade. 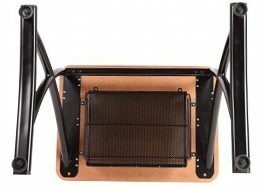 The soft interlocking leg supports the dual legs on either side makes this desk the design of the future. 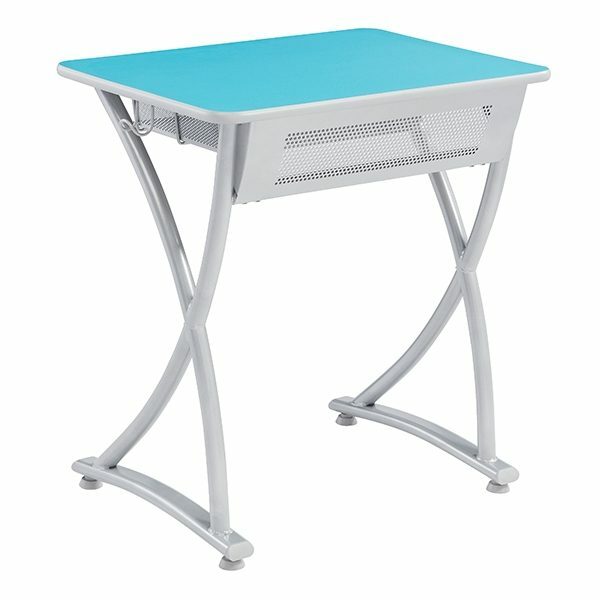 The 500+ square inch desktop is designed to give the students plenty of room for their books and their laptop. The unitized frame design means that the desk is held together by steel tubing; not by the book-box. High Pressure Laminate Desktop: 26"W × 19½"D and 1 1⁄8" thick laminate desktop. Frame: The double leg design consists of two 11⁄4" diameter tubes that are 16-gauge steel. There is a 1" steel tube, 12-gauge steel, welded at 90 degree angle to both of the legs. This allows for connection of the upper frame to the stretcher bar. Adjustable Leg Inserts: Consists of two 11⁄8" diameter, 16-gauge steel chrome legs. Each leg is fastened with two 18 x 1⁄2" machine screws. Legs adjust in 1" increments to heights from 27½"- 31½". Stretcher bar: Steel tube that is 1 1⁄4" in diameter, 18-gauge, that spans from leg to leg. Glides: Adjustable screw-in nylon glides, matched to frame finish. Desktop: 26"W × 19½"D and 5⁄8" thick hard plastic desktop with molded pencil groove. Woodstone Desktops: 26"W × 19½"D and 5⁄8" thick woodstone desktop with molded pencil groove. 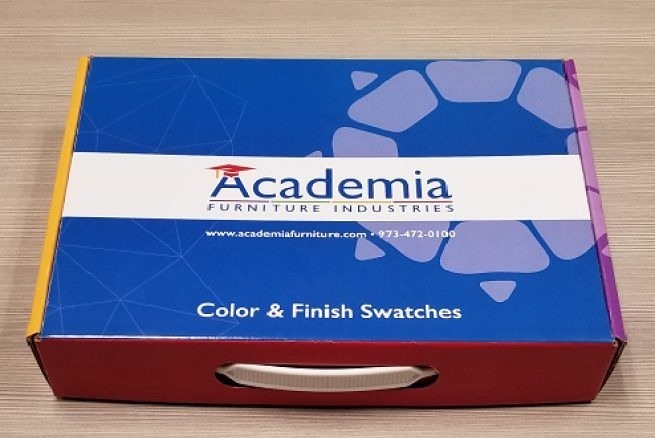 Desktop: 26"W × 19½"D and 1 1⁄8" thick laminate desktop and standard PVC edge banding. 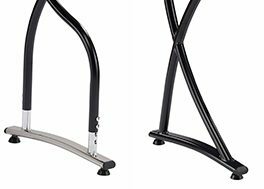 Frame: The double leg design consists of two 11⁄4" diameter tubes that are 16-gauge steel. There is a 1" steel tube, 12-gauge steel, welded at 90 degree angle to both of the legs. This allows for connection of the upper frame to the stretcher bar. This desk is fixed at 26" in height. Hard plastic Desktop: 26"W × 19½"D and 5⁄8" thick hard plastic desktop with molded pencil groove. Frame: The double leg design consists of two 11⁄4" diameter tubes that are 16-gauge steel. There is a 1" steel tube, 12-gauge steel, welded at 90 degree angle to both of the legs. This allows for connection of the upper frame to the stretcher bar. 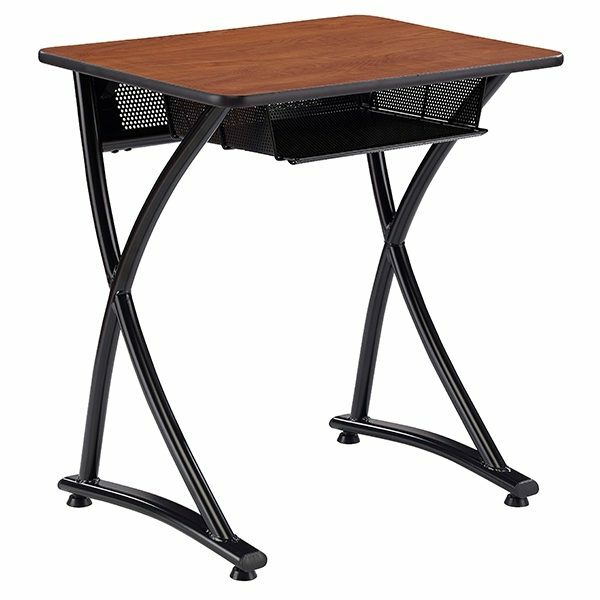 This desk is available in two fixed options, 26" and 29" in height. Desktop: 26"W × 19½"D and 5⁄8" thick woodstone desktop with molded pencil groove.